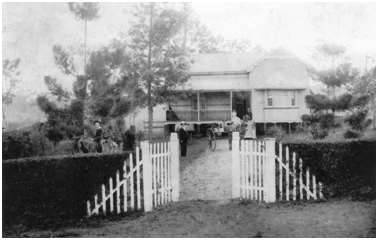 The cottage, called ‘Lorne Villa’, was the residence of Hugh O’Loan (1838-1914), a distinguished member of the Queensland Police Force. O’Loan, who was formerly a member of the Irish Constabulary, applied for entry into the Queensland Police Force on 6 August 1868. He was promoted to Senior Constable in 1874, Sergeant in 1881 and Senior Sergeant in 1894. He was also appointed the first North Pine Clerk of Petty Sessions and District Court Registrar in 1881. Although he was stationed at North Pine only from 1879 to 1890, some members of his family continued to reside in the township during periods when he served elsewhere. After his retirement in 1899, he returned to the family home. During this period, O’Loan also served as a Redcliffe Shire Councillor (1903-1909) and Redcliffe Shire Chairman (1907). A number of small allotments surrounding Lorne Villa were acquired by O’Loan on 6 December 1888. Although it is widely believed that Lorne Villa was built in 1889, this date refers to the erection of another earlier building. Part of the cottage currently occupying the site dates from around 1898; the front section of the cottage is the original 1898 structure, but later additions have been added to the rear of the building. From 1941, Lorne Villa was also the home of the Hart family, another well-known local pioneering family. The property includes a significant group of historical trees, several very large and mature Hoop Pines (Araucaria cunninghamii). 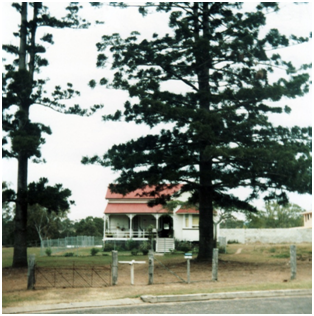 The 2002 Archaeo Pine Rivers Shire Cultural Heritage Survey and Assessment awarded the cottage the highest level of significance rating and concluded that the building “has major historical significance because of its age, is uncommon for its type and maybe the only one in the Shire” and “has major importance for its associations with the O’Loan family and early Petrie history”.